Sector #32 with Vatican Shadow – LIVE. 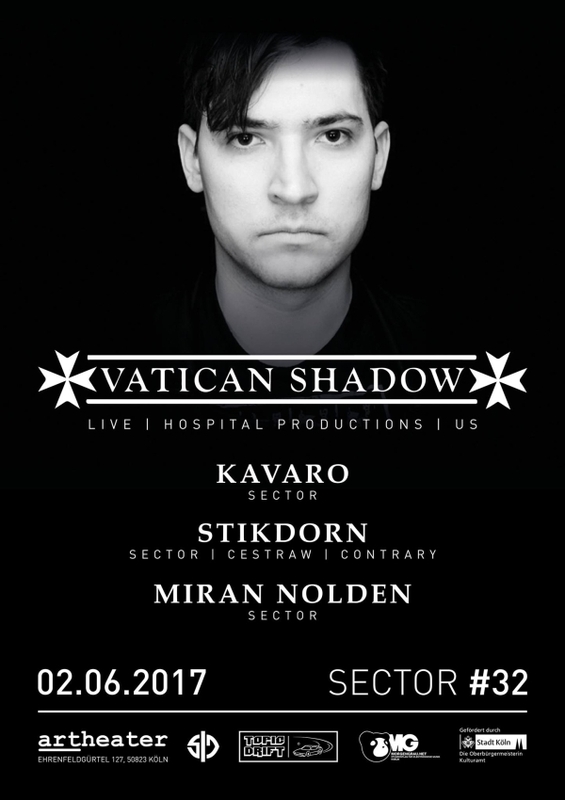 On June 2nd Sector founder Kavaro is celebrating his birthday and he made him and us the best possible birthday gift: He invited Dominick Fernow aka Vatican Shadow from New York for one of his unique mental Live Sets. The founder of Hospital Productions – also known for his projects as Prurient or Rainforest Spiritual Enslavement – released on his own record label and also on Blackest Ever Black, Modern Love or Bed Of Nails. This fantastic night is supported by Sector Residents Stikdorn, Miran Nolden and Kavaro himself. 02.06.2017 – 23:00 Artheater Cologne.